Conspiracy charges enable prosecutors to seek convictions for an agreement to commit a crime (together with a step towards effectuating the crime) even when the actual agreed crime is not completed. “As a general rule a single [drug] buyer-seller relationship, standing alone, does not constitute a conspiracy. Li ewise, evidence of a distribution offense absent an agreement will not suffice to support a conspiracy conviction.” Zuniga v. Commonwealth, 7 Va. App. 523, 528 (1988) (citations omitted). To prove a conspiracy between a buyer and seller, the Commonwealth must show ‘that (1) a seller sold drugs, knowing that the buyer intended to redistribute them and (2) the seller intended to ‘further, promote and cooperate in’ the buyer’s plan to redistribute.’ Feigley v. Commonwealth, 16 Va. App. 717, 722-23 (1993) (quoting Zuniga, 7 Va. App. at 529).” Lavalliere v. Virginia, Record No. 1709-17-2 (Va. App., April 9, 2019) (unpublished). Kristopher Lavalliere was not particularly sharp in protecting himself from a drug sale conspiracy conviction. 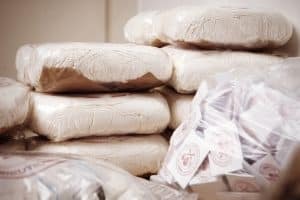 He repeatedly spent hundreds of dollars at a time (at around $100 per gram) buying heroin from the same dealer, Richard Pontani, never seeking a downward price adjustment when the heroin quality was low. Lavalliere had customers ready to buy whatever heroin he had available to sell, making drug quality of no importance to him. Such behavior helped make Lavalliere an easy snitch target for Pontani, who testified against Lavalliere at his bench trial, undoubtedly pursuant to a cooperation agreement to try to minimize Pontani’s clearly high-level prison exposure. If Lavalliere did not know it before being prosecuted, he learned the hard way that when drug dealers are prosecuted, many of them will wag their tongues fast (wisely only with the assistance of a qualified lawyer) in desperation to reduce their own potential prison exposure. Lavalliere possibly also did not know that his activity risked a conspiracy prosecution, for which his sentence was twenty years in prison, with fourteen years suspended. Fairfax criminal lawyer Jonathan L. Katz pursues your best defense against felony, misdemeanor, drug, conspiracy and DUI prosecutions. To discuss your case with Jon Katz, please call his staff at 703-383-1100 for a confidential consultation.